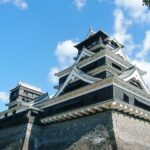 Kumamoto accommodates many interesting sightseeing spots, and it is also famous for its local foods as well. Horse Sashimi, which is called as “Basashi” in Japanese, can be considered as Kumamoto’s most popular local food. 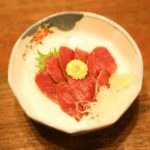 There are many restaurants serving horse sashimi in Kumamoto, and we have listed 10 different restaurants in Kumamoto offering the best horse sashimi for you to try! Kenzo is one of the most famous horse meat specialty restaurant in Kumamoto, and it also offers other Kumamoto’s local foods as well. We strongly suggest you to try the sashimi moriawase consisting tongue, heart, liver, heart’s blood vessel, and brisket. Kenzo only uses the best horse meat available on that day, which are selected carefully by the owner of the restaurant. 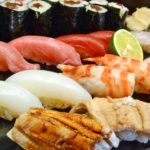 In addition to horse sashimi, you can also try the karashi renkon, hitomoji guruguru, and horse entrails tempura, and horse meat sushi at Kenzo! If you’re looking for restaurants offering horse meat at decent price, then Kumamoto Baniku Yokocho is the best place for you to choose! Baniku Yokocho offers not just fresh horse meat, but also very attractive price as well! We strongly suggest you to try the horse sashimi and horse yakiniku at Baniku Yokocho! Baniku Yokocho also offers reasonable lunch and dinner courses, and you can also order horse meat dishes like horse yakiniku, horse sashimi, broiled horse entrails, and horse steak as well! 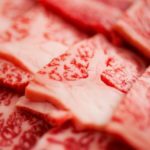 Mutsu Goro is one of the best restaurants offering horse meat in Kumamoto, and the restaurant is always ranked first or second by many media. At Mutsu Goro, you can enjoy exceptional horse meat dishes and fresh seafood taken directly from Amakusa. 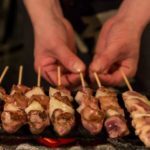 Mutsu Goro offers more than 30 different types of horse meat dishes; from thick horse sashimi to broiled horse entrails. You can also try horse meat sashimi that uses rare parts of the horses, and the horse steaks are very juicy as well. Uma Sakura is very famous among the locals and the tourists, so you would likely see a long line in front of this restaurant. 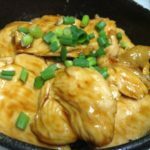 Offering delicious horse sashimi, yakiniku, shabu-shabu, steak, seiro mushi (steamed), and sushi, Uma Sakura is famous for its wide varieties of horse dishes. You can also enjoy horse pasta, pizza, hamburger, croquette, and other fusion horse dishes as well. You can also enjoy eating Kumamoto’s local food such as sakura natto, karashi renkon, and hitomoji guru guru as well. We strongly recommend you to try the special horse sashimi, which tastes very sweet and melts right away in your mouth! Don’t forget to try Uma Sakura’s yukke as well! 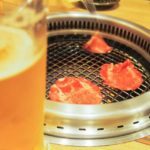 Sakura Shokudo is very famous among the locals for its delicious horse yakiniku. Despite of its small size, Sakura Shokudo is very famous for its great quality of horse yakiniku. 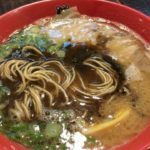 Sakura Shokudo is heaven to all horse meat lovers, as they can enjoy eating many great fresh cuts of horse meat at Sakura Shokudo. 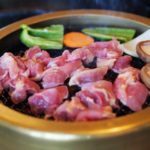 From tongue to Kalbi, you can find many different horse meat cuts there. Don’t forget to try the horse meat rice bowl at the end of your meal! Kumamoto Horumon is famous for its great selection of horse entrails, which can be served as boiled entrails or sashimi. The entrails at Kumamoto Horumon have very soft textures, and you can also enjoy these entrails as yakiniku as well! Kumamoto Horumon offers many different set menu and appetizers with decent price. Don’t forget to stop by Kumamoto Horumon for its great cuts of horse meat! Located on the outskirt of Kumamoto city, Ba Stay offers both cozy atmosphere and delicious horse meat to its customers! Ba Stay uses Kumamoto’s horse meat only, which tastes very sweet and has very soft textures as well. We strongly recommend you to try Ba Stay’s horse sashimi and steak, which taste very juicy. You can also try horse tataki, horse entrails, and horse cutlets as well. In addition to these menu, you can also order horse steak pilaf at Ba Stay as well! Katsumi Shokudo is the best place for you to enjoy Kumamoto’s horse horumon. Established in 1967, Katsumi Shokudo is very famous both among the locals and the tourists as well. Decorated with retro atmosphere, Katsumi Shokudo is very famous for its superb horumon teishoku. 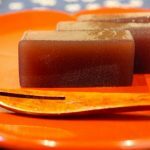 Horumon teishoku consists boiled horse entrails seasoned with miso sauce, and it has very soft textures and smells very good as well. You can choose either small, medium, and large rice for your horumon teishoku as well. In addition to Horumon Teishoku, Katsumi Shokudo is also famous for its delicious niku meshi as well, which consists boiled sliced horse meat seasoned with sweet and spicy miso. For the dinner, you can enjoy stir fried entrails with garlic, horse sashimi, and horse liver sashimi as well! Sakuraan is one of the most fanciest restaurants in Kumamoto serving horse meat dishes, where you can enjoy eating the finest quality of Kumamoto’s horse meat. Sakuraan serves horse meat sashimi like tongue sashimi and liver sashimi, and it also serves horse cutlets, tataki, croquette, and many more. Sakuraan also uses homegrown vegetables as the ingredients of the meal, and natural water as well. 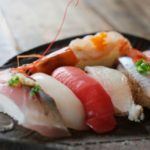 Sakuraan also serves fresh seafood dishes with ingredients taken directly from Amakusa, so you should definitely visit Sakuraan when visiting Kumamoto! Suganoya Horumon is one of the most famous restaurants in Kumamoto offering fresh horse meat dishes, and it has 4 branches in Kumamoto and 1 branch in Hakata. Suganoya is very famous among the locals and the tourists, and it serves best horse meat cuts in many different forms. We strongly suggest you to try the horumon at Suganoya, which can be eaten as sashimi or yakiniku. One of the best menu is horse motsu nabe and horsetail karaage. The liver sashimi and sakura yukke is very exceptional! Worth to visit for its delicious horse meat, why don’t you stop by Suganoya Horumon when visiting Kumamoto? Let’s Enjoy Best Horse Meat Sashimi (Basashi) in Kumamoto! 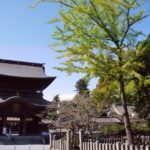 Kumamoto is not only famous for its great sightseeing spots, but also for its huge collections of local foods. Horse Sashimi is one of the most famous local foods in Kumamoto, so why don’t you try it when visiting Kumamoto?